I just got this great salad spinner from Brieftons. We eat a salad with just about every meal so I was really needing a fast and efficient way to clean, dry, and prepare my veggies. This is a nice large salad spinner that you can fit a lot of salad or veggies in. Simply place them in the basket and then set inside the large bowl. Attach the lid it fits snugly so it won’t come flying off. The spinner works very smoothly, it spins really easily and quickly. Simply spin out your veggies, I wash mine and the pop it in to run through the spinner to get all that excess water off and it’s ready to eat! I love that the handle is a pump handle, it much easier to use then turning a crank. It only takes a few pumps and your salad is ready to go! Super easy to use and works great! ✓ Large 7.3 Quart Capacity, Unbeatable for the Price ✓ SUPERIOR QUALITY & EASY STORAGE: Made from heavy duty, BPA-free, food-safe, ABS plastic for the utmost safety and durability. Big 7.3 quart bowl capacity while still being compact enough to store away neatly, thanks to the handle that can be locked down and the lid that can be turned upside down for space friendly, non-invasive and easy storage. ✓ CONVENIENCE AT YOUR FINGERTIP: Unique two-in-one BPA-free design features a removable colander and bowl that doubles as a food-safe elegant serving dish, perfect for juicing prep and party presentation. Large colander and serving bowl accommodate all your greens and herbs. Easy washing of removable components and dishwasher safe. No assembly required, ready to use out of the box. Ideal size for families large or small. Accommodates bigger party spinning in multiple batches in no time. ✓ SUPERIOR VALUE: Bundle includes the Brieftons Salad Spinner, a printed manual, the exclusive Brieftons Spiral Slicer Recipe ebook, the Brieftons Guide to Summer Salad Recipes ebook, and The Benefits of Raw Foods ebook, with exclusive recipes you can make using your salad spinner right away, plus outstanding Brieftons customer support, and more Brieftons ebooks on the way. ✓ PATENTED TECHNOLOGY FOR THE BEST PERFORMANCE: Enjoy a natural, easy pump mechanism that works better than even the best vertical pump salad spinners. The pump-style design makes it very easy for people of all ages and abilities to use without the need for significant hand strength or fine motor skills. Ergonomic pump handle requires no more than 2 or 3 pumps to reach its smooth and ultra quiet maximum spinning velocity. It delivers a frictionless spin action with an instant stop button designed to protect and increase the life of the gears. Centrifugal high speed spinning technology spins the food dry in a matter of seconds, effectively reducing germs and potential bacteria. Wide aerated basket allows for effective spinning. Low center of gravity equals great stability during operation. 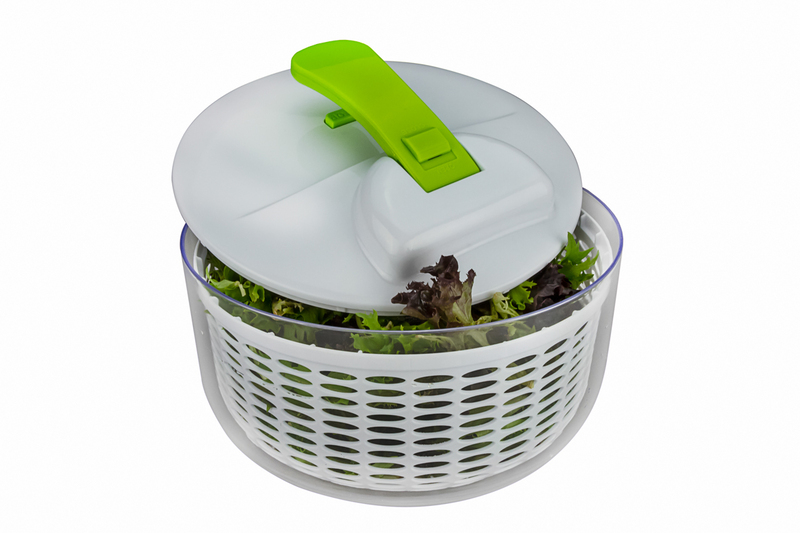 Continuous turning in the same direction allows the salad spinner to achieve higher RPM than most other spinners, resulting in the driest, crispest lettuce possible. ✓ HOW DOES IT HELP YOU? Eating raw vegetables has been scientifically demonstrated to enhance wellbeing. Using the high end, ergonomic Brieftons Salad Spinner is the fast, efficient, affordable, chic way to maintain a healthy lifestyle and improve diet. Arugula, spinach, frisee, endive, lettuce, romaine, cabbage, broad-leafed herbs, and cress are just some of the many vegetables that can be dried effortlessly by the Brieftons Salad Spinner to be used in your daily salad intake. ✓ BUY WITH CONFIDENCE: We are the trusted kitchen brand with thousands of happy customers. You get a full unconditional money back guarantee if you are not happy with your Brieftons salad spinner.